This year’s Spring Fest lineup leaked on Ticketmaster early Monday as Mac Miller, The Chainsmokers (pictured) and Coleman Hell. The Student Association confirmed these artists and a fourth, Icona Pop, will be performing at Spring Fest on April 23, with The Chainsmokers headlining. Electronic music and dance (EDM) duo The Chainsmokers will headline this year’s upcoming Spring Fest. Pittsburgh-based rapper Mac Miller, Swedish pop duo Icona Pop and indie pop artist Coleman Hell will also perform for the concert, which will be held at Alumni Arena on Saturday, April 23. The Spectrum reported Monday afternoon that Ticketmaster’s website had listed The Chainsmokers, Mac Miller and Coleman Hell as coming to UB for Spring Fest. 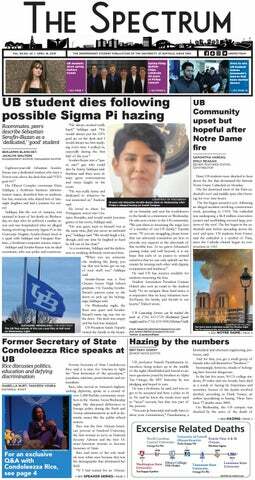 After Student Association Vice President Sean Kaczmarek initially could not confirm the artists, SA Entertainment Director Terese Regan confirmed all three artists late Monday. SA made its official announcement Tuesday, which included the news that Icona Pop would also perform. By Tuesday, the ticket distribution company had deleted the show listing off its website, but the post had previously said general admissions tickets will go on sale March 29 at 10 a.m.
Spring Fest is the second concert hosted by the SA this spring semester. The first was a small concert headlined by MS MR on Feb. 20, which only drew 204 students. Hip-hop artists Big Sean, Jeremih, Isaiah Rashad and Tink performed for Fall Fest in September. Spring Fest and Fall Fest are SA’s two biggest events of the academic year. The concerts, like SA, are funded by undergraduate students through the mandatory student activity fee of $104.75 a semester. All undergraduate students get into the concerts for free with a student ID. SA Entertainment has about $390,000 for total talent budget and $350,000 for production. The MS MR concert cost about $70,000, while last Fall Fest cost $163,700 of the allotted budget. The final costs for this year’s Spring Fest are not yet finalized, according to Regan. The genre choice of Fall and Spring Fests is often scrutinized by students, with some who feel hip-hop is too prevalent. When The Spectrum reported Ticketmaster’s listings of the artists, reaction on social media was generally positive. The headliner, The Chainsmokers, is a departure from the usual rap-centered headliner. In 2015, Spring Fest was alt-rock themed, with Young the Giant, Banks, Bear Hands, In the Valley Below and Royal Tongues. Some students, like Nicole Imgersoll, a senior business major, said that she would have liked the same alt-rock focus as last year. “We need more diversity because we always have rappers,” she said. Regan said in an email that diversity was the main focus for this year. “Our focus is to always satisfy students, but I think we decided to change things up this fest with the mix of genres,” she said. This year’s student polls for genre choice, she said, indicated that rap and EDM were the most popular genres. SA has utilized an online student poll regarding desired Fall and Spring Fest genres to try to make decisions more pleasing to students. SA hopes this year’s lineup, with The Chainsmokers and Mac Miller as EDM and rap components, respectively, reflects that diversity. The Chainsmokers formed in 2012 in New York City. They first started their career by remixing popular singles from indie bands. Soon after, the band started making its own music. Their first two singles “Erase” and “The Rookie” helped the duo get noticed by Dim Mak Records and then Republic Records. Their manager Adam Alpert helped them get their current record deal with Sony Music Entertainment. They are currently touring off of their debut album, which will be released sometime in 2016. Mac Miller is an American rapper from Pittsburgh. He career jumped off when he was 18, when he signed with Rostrum Records. He released his first debut album Blue Slide Park a year later. Since then, Miller has led an extensive career. He dropped Rostrum to form his own record label, REMember Music, in 2013 and released Watching Movies with the Sound Off in the same year. Miller is currently on tour for his latest work, GO:OD AM, which was released through his first major label deal through Warner. Bros Records. Later, the duo released their debut album Nights Like This on Mercury Records. Since then, the Swedish stars have been touring their music around the world. Their most recent album, This is… Icona Pop, was released in 2013. Angela Barca and Tom Dinki contributed reporting. Brian Windschitl is the senior arts editor and can be reached at brian.windschitl@ubspectrum.com.